In 1875, Rush Medical College moved to Chicago’s West Side and constructed an elaborate, multi-use building at the corner of Wood and Harrison streets. The building’s cornerstone held early issues of the Chicago Medical Journal, various Chicago newspapers, tourists’ guides to Chicago for 1875, a city directory, the valedictory address for 1871, photographs of former faculty, and a copy of the 1837 Rush Medical College charter. In 1924, the building was demolished to make room for the new Rawson laboratory, and Rush Medical College faculty explored the capsule’s contents. 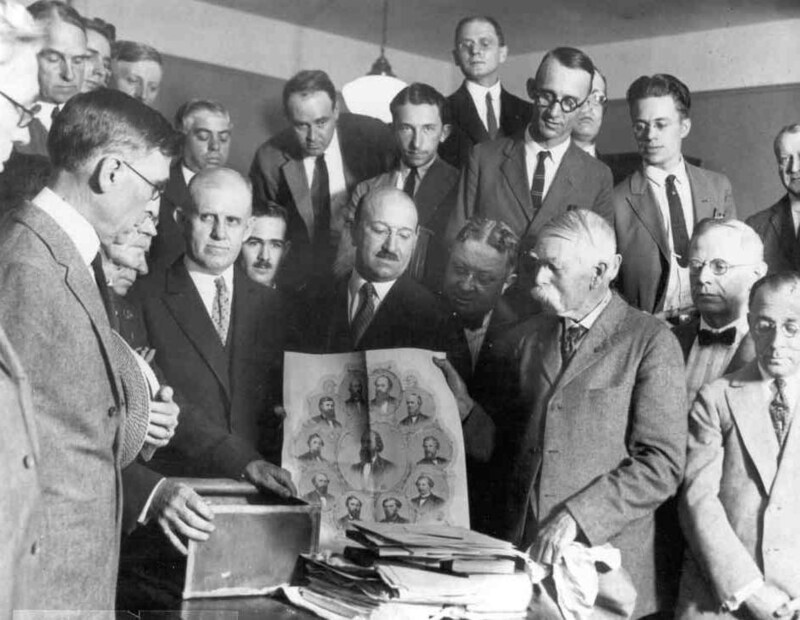 Shown in this photograph are, among others: Edwin L. Holmes; James Spencer Dickerson; O.B. Swanson; Arthur E. Wood, grand master of the Illinois Lodge of Masons; Judge Henry Horner; Dr. C.T. Barnes; Dr. Robert H. Herbst and James H. Harper. Heather Stecklein is an archivist with Rush University Medical Center. You can contact the Rush Archives at rush_archives@rush.edu or at (312) 942-7214.